Pulmonary alveolar microlithiasis (PAM) is a rare lung disease characterized by the deposition of calcium in the alveolar spaces and bilateral diffuse micronodular ‘‘sandstorm’’ radiographic pattern. 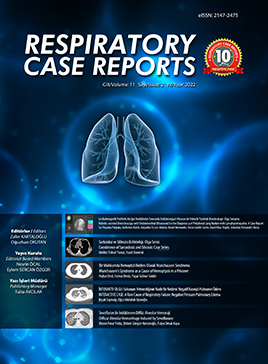 The current report presents the case of a 48-year-old woman with pulmonary alveolar microlithiasis. The patient presented with exertional dyspnea for the past five years. The physical examination was within normal limits and respiratory sounds were normal. The chest x-ray revealed a bilateral diffuse micronodular pattern in the middle and the lower areas of both lungs. On the parenchymal window of thorax computed tomography (CT), bilateral diffuse widespread millimetric calcified nodules that were more prominent in the lower lobes were observed. Whole body bone scintigraphy with technetium-99m revealed bilateral, diffuse, heterogeneous, increased uptake in the pulmonary parenchyma. Regarding the current special radiological findings, further invasive diagnostic examination was not performed, the patient was diagnosed with PAM and continues to be followed-up on without treatment. Pulmoner alveoler mikrolitiyazis (PAM) alveollerde kalsiyum birikmesi ile karakterize nadir görülen bir akciğer hastalığıdır. Her iki akciğerde yaygın simetrik mikronodüler radyolojik pattern mevcuttur. Bu yazıda 48 yaşında PAM tanısı alan bayan hasta sunulmuştur. Hasta 5 yıldır eforla gelişen nefes darlığı ile başvurdu. Fizik muayene ve solunum sesleri normaldi. Akciğer grafisinde orta ve alt alanlarda bilateral yaygın mikronodüler patern saptandı. Bilgisayarlı toraks tomografisinde parankim penceresinde bilateral alt loblarda daha belirgin olmak üzere yaygın milimetrik kalsifiye nodüller izlenmekteydi. Teknesyum-99m ile yapılan tüm vücut kemik sintigrafisinde her iki hemitoraksta yumuşak doku alanlarınında heterojen tarzda diffüz artmış aktivite tutulumu saptandı. Mevcut radyolojik bulguların uyumlu olması ile ileri girişimsel tetkik yapılmadı, hasta PAM tanısı ile tedavisiz takibe alındı.